Etta started her career in 1954, lasting until 2012. She died January 2013 at the age of 73. This tune is now part of a Heinz commercial and was a it in 1960. 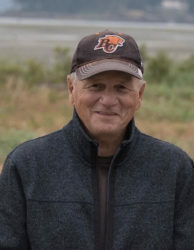 Chuck Benson – Started his broadcast career in 1960 as a writer at CKYL, Peace River, AB, where in 1965 he won the Gold Leaf Award (now called the Juno) for Top Disc Jockey for Canada. From there, a brief stint at CFRN, Edmonton, AB as Promotions Manager for AM/FM Radio. Then in ’62 helped open CKNL Fort St. John, BC. In ’68 Chuck and two others (Ernie Mushtuk and Ernie Mykyte) started up Yellowhead Broadcasting Ltd out of Edson, AB, eventually ending up with satellites in Grande Cache, Jasper, Whitecourt and Hinton, AB. He sold his interests and moved to Vancouver, ending up with CFVR, Abbotsford as General Sales Manager, then Manager of CHPQ, Parksville, and eventually as a Sales Consultant with CIGV-FM in Penticton. Chuck is retired from broadcasting and living with his wife in Parksville.